The United States has the worst performance of all developed nations in the world, and sometimes worse than in third world countries. People without private insurance in the USA are stuck. Even people with private insurance more often than not are not covered for pre-existing conditions. For instance, I had my cataracts removed from both eyes at the cost of only $2,500 C per eye (C$ worth about 78 cents US$), whereas in the USA the cost is $4,500 US per eye, and sometimes insurance companies will only pay for the operation, and not the lenses if you are insured. Before we can plausibly (and frequently tentatively) decipher even a single Linear A tablet on olive oil, we must decipher as many as we can in Linear B, because there are so many facets to be taken fully into consideration in the olive oil sub-sector of the agricultural sector of the Minoan/Mycenaean economy related to the production of olive oil which on an adequate number of Linear B tablets (at least 10), mostly from Knossos, dealing with harvesting from olive oil trees and the production and delivery of olive oil that we must account for every single term related to olive oil on the Linear B tablets, and then compile a list of all of these terms in order to cross-correlate these with equivalent terms on the Linear A tablets, mostly from Haghia Triada. 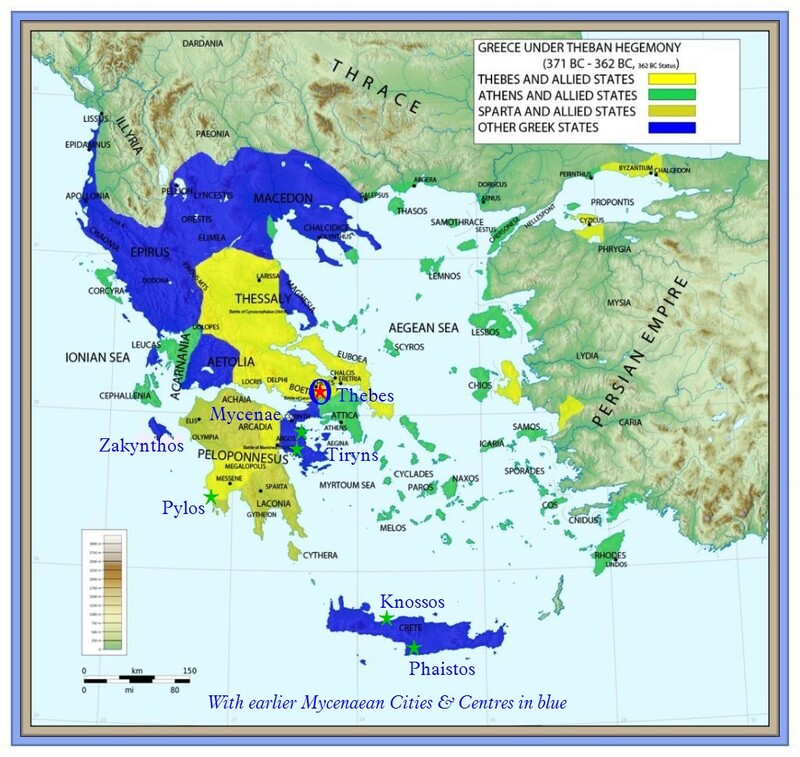 The gravest challenge confronting us in the cross-correlation of the several economic terms related to olive oil production in the late Minoan III 3a period under Mycenaean suzerainty (ca. 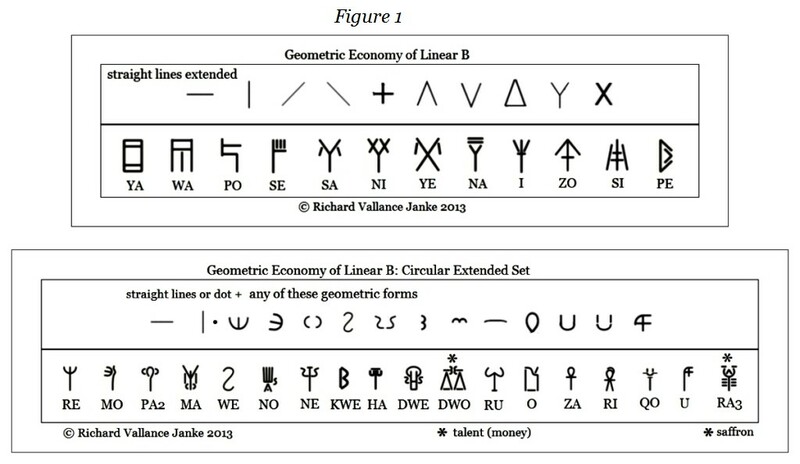 1500-1450 BCE)  with potentially equivalent terms in Minoan Linear A arises from the mathematical theoretical constructs of combinations and permutations. Given, for instance, that there are potentially a dozen (12) terms related to olive oil production on an adequate number (10-12)  Linear B tablets to afford effectual cross-correlation, how on earth are we to know which terms in Mycenaean Linear B correspond to apparently similar terms in Minoan Linear A? 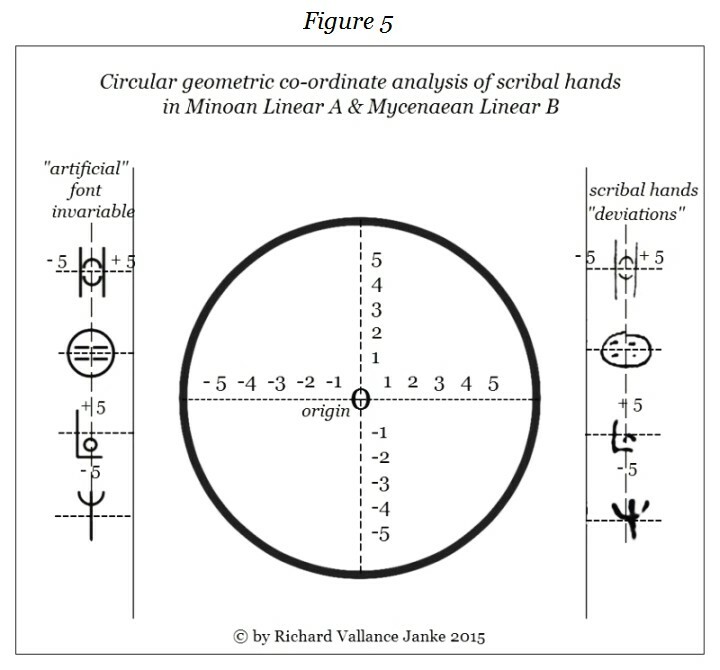 In other words, if we for instance extrapolate a total of 12 terms from Mycenaean Linear B tablets, how are we to line or match up the Mycenaean Linear B terms in a “Column A” construct with those in Minoan Linear B in “Column B”? There is no practical way that we can safely assert that term A (let us say, for the sake of expediency, that this word is apudosi = “delivery”) in Mycenaean Greek corresponds to term A in Minoan Linear  A, rather than any of B-L, in any permutation and/or in any combination. 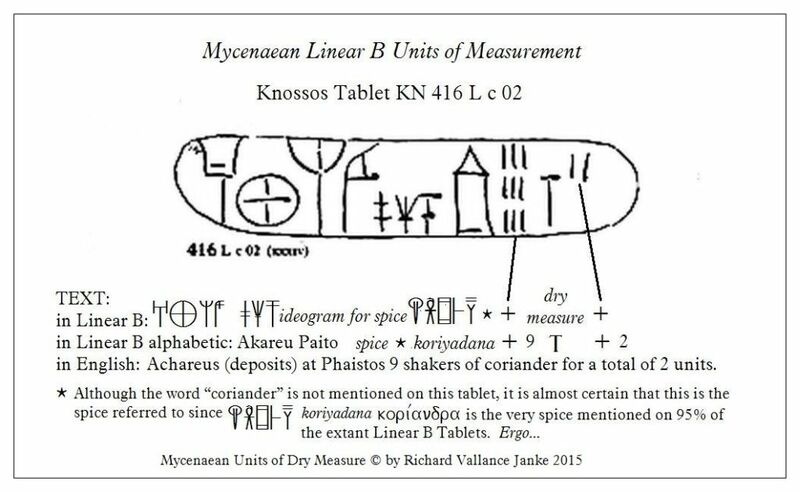 This leads us straight into the trap of having to assign ALL of the signified (terms) in Mycenaean Linear A to all of the signified in Minoan Linear B. I shall only be able to definitively demonstrate this quandary after I have deciphered as many Linear B tablets on olive oil as I possibly can. For the time being, we have no choice but to set out on our search with these 3 tablets, all of which prepend the first term apudosi = “delivery” to the ideogram for olive oil. In closing, I wish to emphatically stress that this is precisely the signified I expected to turn up in the list of terms potentially related to olive oil production in Mycenaean Linear B. It is also the most important of all Mycenaean Linear B terms prepended to the ideogram for “olive oil” on the Linear B tablets. 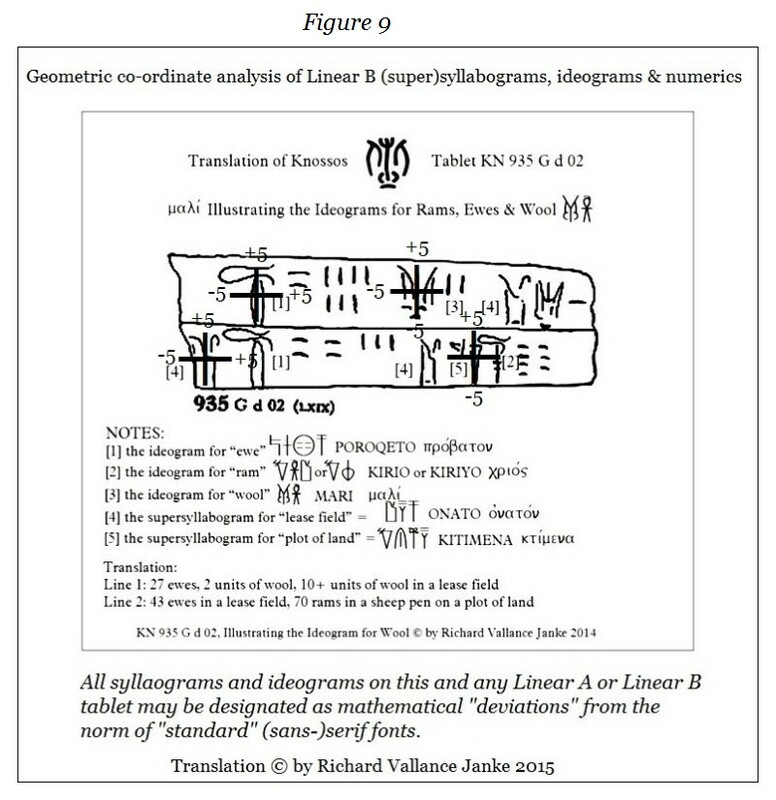 When we come to making the fateful decision to assign the the “correct” Minoan Linear A term meaning just that, “delivery” on the Linear A tablets dealing with olive oil, how are we to know which Linear A signified corresponds to Linear B apudosi = “delivery”? Still the situation is not as bad as you might think, at least for this term. Why so? Because if it appears (much) more often on the Linear B tablets (say, theoretically, 5 times versus less than 5 for all the other terms in Linear B related to olive oil), then the term appearing the most frequently on Minoan Linear A tablets related to olive oil is more likely than not to be the equivalent of apudosi, i.e. to mean  “delivery”. The less frequent the occurrence of any particular term relative to olive oil on the Mycenaean Linear B tablets, the greater the room there is for error, to the point that where a term appears only once on all of the Linear B tablets we can manage to muster up for translation, it becomes next to impossible to properly align that term with any of the terms occurring only once on the Minoan Linear A tablets, especially where more than one signified occurs on the Mycenaean Linear B tablets. If for example, 3 terms occur only once on the Linear B tablets, which one(s) aligns with which one(s) on the Linear A? A messy scenario. But we must make the best of the situation, bite the bullet, and cross-correlate these 3 terms in all permutations and combinations (= 9!) 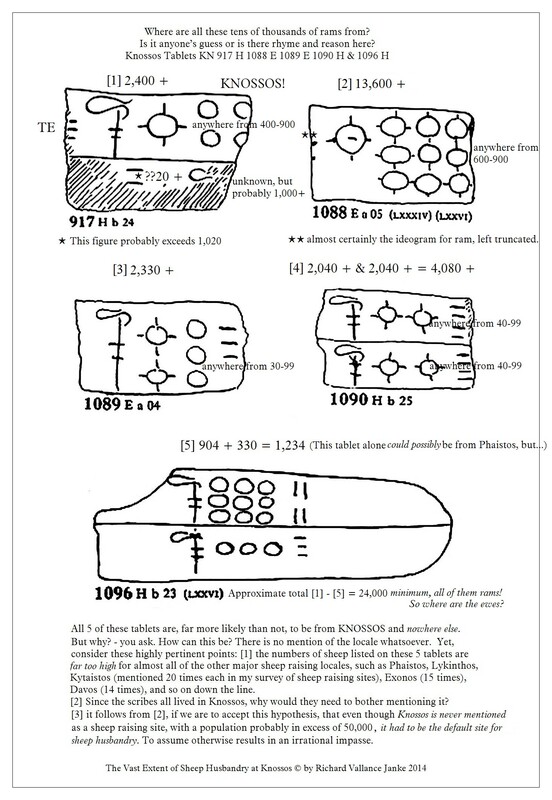 from the Linear B to the Linear A tablets containing them. This I shall definitively illustrate in a Chart once I have translated all terms related to olive oil production in Mycenaean Linear A. Because this tablet is largely intact, it is fairly easy to translate. But there are still a few small problems in the second line. First of all, the total wheat production for 1 month (or does this mean, the average monthly wheat total for 1 year?) is given as approx. 3 kilograms, if we are to trust the measurement table established by Andras Zeke of the Minoan Language Blog- and there is no reason why we should not under the circumstances, namely, that we really have no idea what the actual total (represented by the Linear B logogram which looks like a T) for dry measurement was. So kilograms will do as well as anything. Still, at least the system appears to have been metric. This is followed by a much larger output for barley of 3 x 9 = 27 kilograms, which strikes me as a little bit odd, given that wheat was probably the staple crop, followed by barley. On the other hand, there is nothing to indicate that this is a monthly total for barley. In fact, the total of approx. 27 kilograms is immediately followed by the number 7. 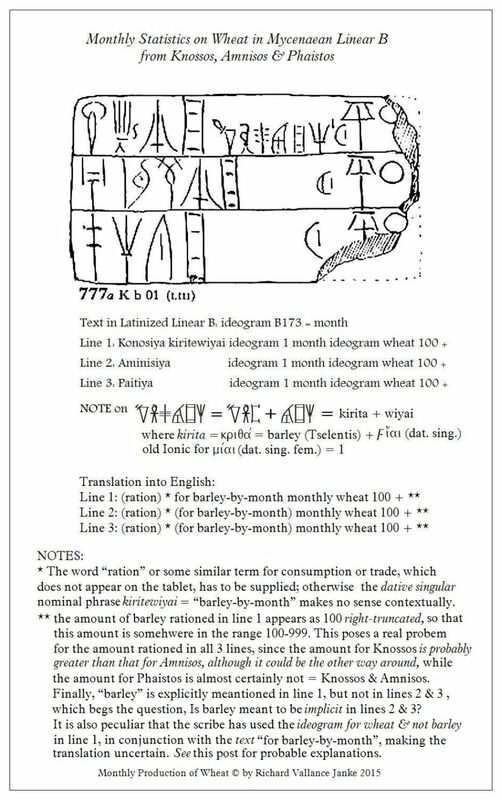 My interpretation of this apparently stray number is that it may represent 7 months (the ideogram for month being conveniently omitted), yielding a total of a little less than 4 kilograms per month, which would align the barley production total with the wheat. But this still strikes me as really odd. 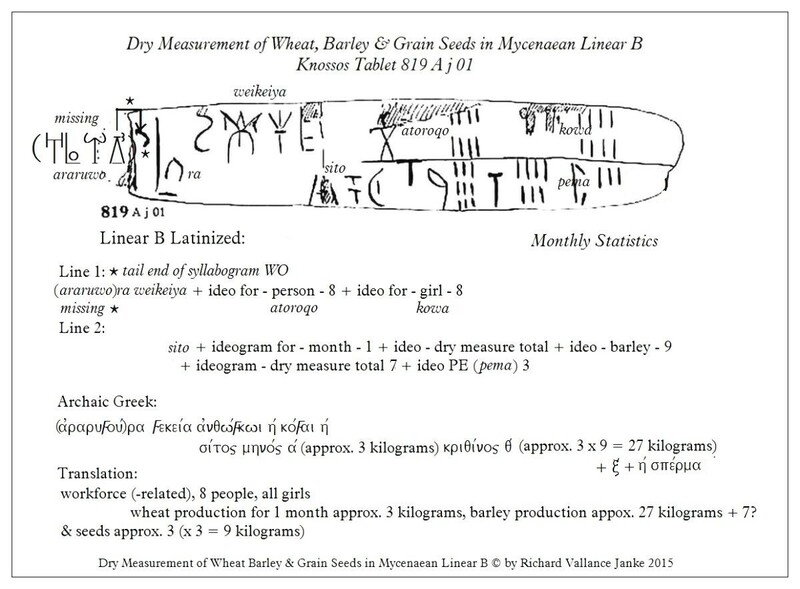 Why would the scribe assign the total for only 1 month’s production of wheat, and follow it up with the total production of barley for 7 months? This does not make much sense. We then have a total production of about 3 x 3 = approx. 9 kilograms of seed, if I am interpreting this right. The reason I assign 3 x 3 = about 9 kilograms of seed is this: I believe the scribe deliberately omitted the T logogram (which is equal to about 3 kilograms), hence 3 (x 3) = 9. Why would he do that? It is really quite simple. He has apparently omitted the ideogram for “month” right after the number 7. He has already used the T logogram twice on this line, and so – again to save valuable space on a very small tablet - he simply omits it the third time (as he did for the second occurrence for “month”), since he knows that all of the other scribes clearly understand that it is implicit. Just another shortcut. More shorthand. Big surprise. Still, the statistics do not seem to square. Our translation of the inventory totals just does not “feel right”. For this reason, I have to reserve judgement on the translation, given that there appears to be something the scribes all implicitly understood - I am not quite sure what – but which we do not at a remove of some 32 centuries. And I fear I may have taken the scribal practice of omitting what was “obvious” to the scribes a little too far. Knossos, of course! I have a number of relevant comments to make on this fascinating numeric tablet, which is is typical of the scads of numeric tablets the Minoan scribes (mostly at Knossos) produced for inventory, just as they did with pretty much every other agricultural animals or crops, or economic merchandise or trade in general. One of my comments in particular [2 infra] turns on the possibility, if not probability, that the word in question may even be Minoan! the numbers to the left of the generic ideogram for sheep seem to be meaningless, for lack of context, the usual bugbear that plagues so many Linear B tablets. What these numbers, which seem quite haphazard, refer to is anyone’s guess, but I prefer to think of them as mere practice scribblings. 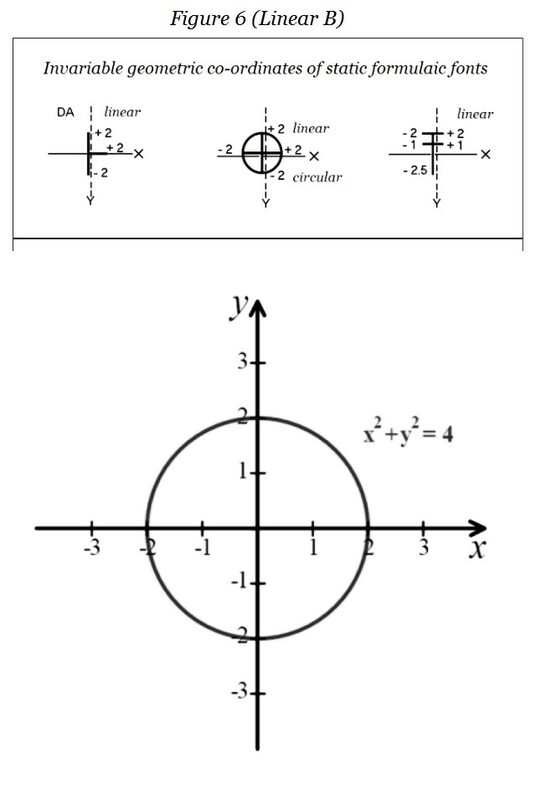 On the other hand, they may refer to the ideogram  below. See infra. This is undoubtedly the ideogram for “month”. The problem is, what does the supersyllabogram RE immediately preceding it refer to, if not the name of the month itself? And that is just what I take it to mean. The difficulty we are now faced with, what is the name of the month which begins with the first syllable, the syllabogram RE? We cannot assume it is a Classical Greek name for any month, because in the Minoan & Mycenaean era (ca. 1900 BCE – 1200 BCE), Classical Greek month names did not exist. So either the month name referred to here beginning with the supersyllabogram RE is a Mycenaean Greek month name or even a Minoan month name, for the simple reason that the Minoan scribes writing in Mycenaean Greek sometimes very likely transposed (i.e. used) Minoan names for islands, municipalities, names of people, names of the seasons and months etc. 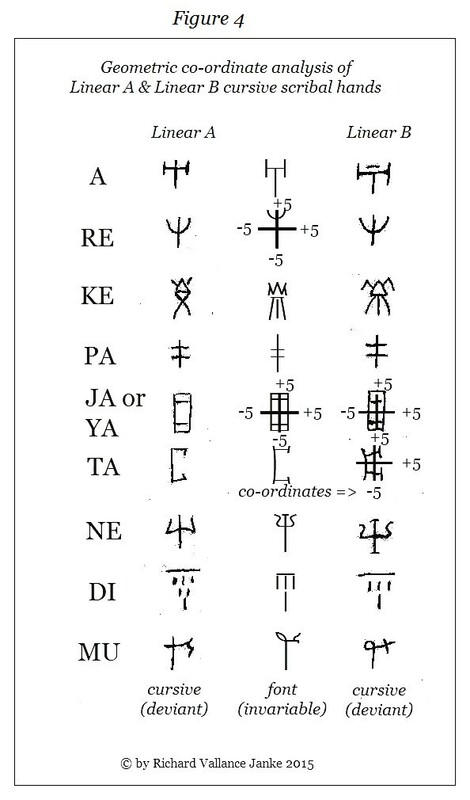 This practice, if indeed it was their practice, may very well serve to provide a definite clue to the categories of Minoan vocabulary I refer to above, and then some. It is an approach to the partial decipherment of Linear A we need to take seriously. 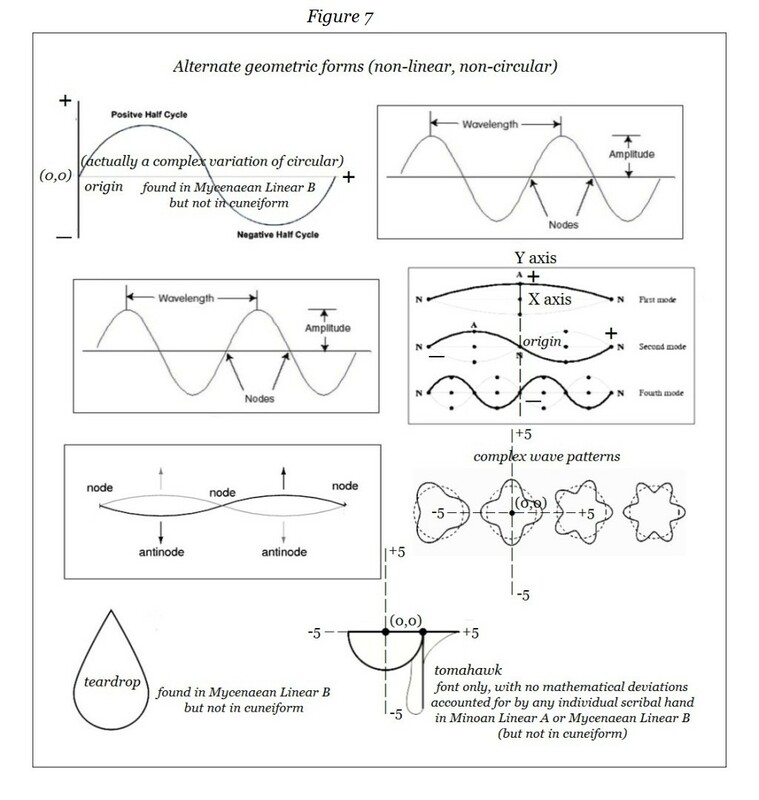 The problem with supersyllabograms such as RE is that they are only the first syllable of any word they represent, and are thus incapable of revealing what the word behind the supersyllabogram in question refers to, unless we already know the language the supersyllabogram is used for. If the language is Mycenaean Greek in Linear B, then we stand a (usually remote) chance of deciphering the word, but if the word is Minoan, and – I must strongly emphasize this – a Minoan month name written, not in Linear A, but in Linear B (since this is after all a Linear B tablet) we stand no chance whatsoever of deciphering the month name, at least for the present. This ideogram looks remarkably like the ideogram for “honey”, but wait! Hold on now! Does that make any sense at all in the context of this tablet, which otherwise and principally provides meaningful statistics on sheep, and nothing else? 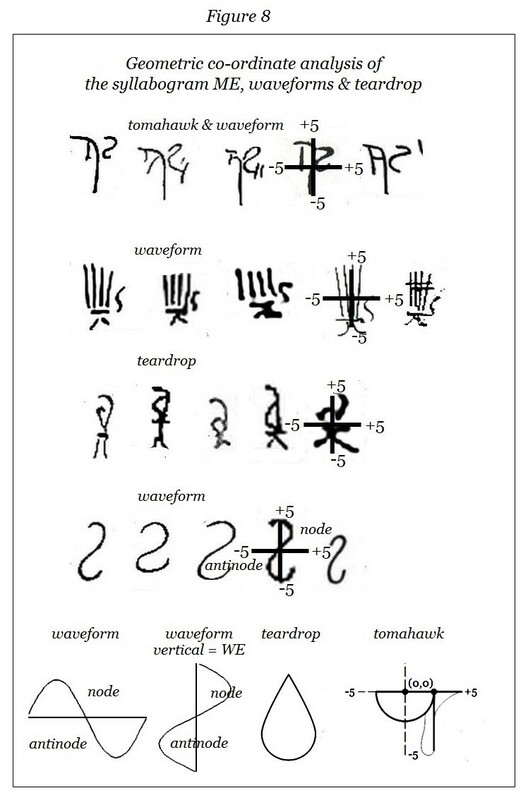 So it appears that suggesting this is the ideogram for “honey” may be stretching the limits of credibility, especially in light of the fact that the numbers to the left of the generic ideogram for “sheep” appear haphazard at best, hence, probably meaningless, except as (practice) doodles. There is simply no way of knowing. The scribe appears to have effaced the lower half of this 1K (1,000), but I prefer to assume that he did so in error. If not, then the total number of sheep would be 21,804 rather than 21,904, as if that makes much of a difference! It is still a helluva lot of sheep. This modified ideogram for “person”, in which the person appears to be holding a spear or something of that ilk, poses a few problems, none of them insurmountable, and any of which may be valid in the context of this tablet. First of all, why would a person hanging around sheep bear a spear, except to chase off predators such as wolves? If we assume that this modified ideogram actually means “shepherd”, then the problem almost resolves itself. Almost. The difficulty now is, what is the shepherd holding? It certainly could still be a spear, but shepherds usually hold staffs, and so that it what I take it to mean for this modified ideogram, unless... this is the signature of the scribe, which is an entirely plausible alternative. So this ideogram could mean 1 of 3 things. Take your pick. Last, but far from least, we are still left with two nagging questions. How is it possible that this tablet, in combination with the 5 tablets on rams from Knossos, all 6 of them, can yield a mind-boggling total of over 45,000 sheep? Was the even countryside around Knossos capable of sustaining such an immense number of livestock, let alone only sheep, not counting bulls & cows, horses etc. etc.? What is going on here? Have our assiduous scribes gone overboard? The answer is simply, no. The second part of our question must reference the time, i.e. the year, season or month each and every one of these tablets was composed. This is no idle matter for speculation. The tablet in this post seems to refer only to the month RE, though only on the left side of the ideogram for sheep, leaving us with the question whether the rest of the tablet dealing only with sheep to the right of the ideogram for sheep, refers to the same time period, i.e. on month, that month being RE. It could go either way. But once again, we shall never know. It simply strikes me as a little odd, in fact bordering on the ridiculous, that there would be 45,000 sheep around Knossos all at once! However, the explanation for this oddity follows. Once we clear that up, we can then conclude, within reasonable parameters, that there more than likely were never as many as 45,000 sheep wandering around, stinking up the countryside, and posing an awful environmental hazard to the city of Knossos. Otherwise, the city, as prosperous and as clean as the Minoans were, would never have survived more a few years. But ostensibly it did. I have addressed this issue before in posts where I refer to the strong likelihood that the Minoans, being the advanced civilization they were, were not only plainly familiar with the basic principles of hydrology and plumbing (which they most certainly were), but equally with the principles and practice of crop rotation and even rotation of animals in husbandry. If we allow for this scenario, then there would more likely than not, be far fewer than 45,000 sheep hanging around Knossos in any given running or fiscal year, though how many there would be we can never know... except that, given the fact that almost all sheep-related tablets from Knossos itself rarely inventory fewer than 5,000 sheep on any one tablet. So we can at least speculate an annual figure of some 5,000-10,000 sheep, if nothing else. And who is to say this tablet, and any or all of the remaining tablets, were inscribed in the same year? Again, no idle question, for two inescapable reasons. The Minoan scribes kept annual statistics for absolutely anything and everything they inventoried, and erased the very same tablets on which these annual statistics were inscribed, and replaced the whole shebang with the new statistics for the next fiscal year for the same inventories of whatever they were recording (sheep, rams, ewes, cows, bulls, horses, chariots, armour, vessels and vases of all kinds, cloth, jewelry, you name it, the list goes on and on and on). In other words, putting it in a nutshell, there is simply no way of determining whether any or all of these 6 tablets in this and the previous post originate from the same “wetos” or “running year” = fiscal year, as the Minoan scribes so aptly called each inventory year. Add on top of this scenario the fact that all 4,000 or so of the tablets at Knossos were unearthed from the rubble of either a massive earthquake or the destruction of the city by invasion (the place is scarred with burns), or both, how can anyone be sure that any fragments laying side-by-side in the messy rubble on any aspect of Minoan life whatsoever, are from the same year, let alone the same category of inventory shelves on which they were almost certainly stored according to some classification system making it easy for the scribes to retrieve any tablet on any aspect of the Minoan agri-economy for any given running year, i.e. fiscal year? Once again we are at an impasse, up against a solid (or if you like, crumbling) brick wall. The likelihood that there is a strong relationship, some sort of relationship, or little relationship at all between one tablet and the next lying beside aside in the rubble that Sir Arthur Evans and company had to all too meticulously and cautiously rummage through remains an open question at best. True enough, as I have myself discovered in certain sequential ranges of tablets and fragments in Scripta Minoa, there are several instances in which the tablets in a particular entirely intact series, say speculatively, KN 1610 – KN 1654, for the sake of argument, all deal with the very same aspect of the Minoan agri-economy, for instance, sheep, rams and ewes, but even when they do, there is still absolutely no guarantee that any of these intact sequences all deal with the same running or fiscal year. And all too many adjacent tablets are not directly related. So we are left with the same enigma we were confronted with in the first place. Where are all these tens of thousands of rams from? Guess. One guess & you’re right! which I strongly suggest you read, if you are at all fascinated by the Minoan economy and their international trade, especially in the area of sheep raising and husbandry, which was the vital underpinning of their entire subsistence as a people, outweighing by far all other economic activities of any kind whatsoever. Regardless of the fact that the scribes at Knossos never mention the city as a sheep raising site, it was in fact the primary locale for sheep husbandry, for the simple, plain reason that only a city of this size, with a population probably in excess of 50,000, enormous for the ancient world, had the human and land resources to accommodate such huge numbers of sheep as illustrated above, i.e. 24,000 at the very minimum, and only on these 5 tablets! In the next post, I shall post a Linear B tablet from Knossos, in which the numbers of sheep mentioned will literally blow you away! If anyone thinks even for a moment that any of the other sheep raising locales mentioned at the outset of this post had anywhere near the land space and human resources sufficient to raise such huge numbers of sheep, that person is probably deluding him- or herself. We are left with one bizarre mystery. The only thing that utterly baffles me is, where are all the ewes! That question, not a rhetorical question at all, begs the issue. I simply cannot figure this out for the life of me. How can you raise any new sheep, i.e. newborns, if there are no ewes around! If anyone has any suggestions or comments whatsoever to help us unravel this plainly weird mystery, be my guest! CRITICAL POST: The Minoans counted sheep while they were wide awake… big time! CRITICAL POST: The Minoans counted sheep while they were wide awake... big time! An In-depth Statistical Analysis and Wide Cross-Section of over 2,500 tablets and fragments out of the approximately 4,000 at Knossos dealing specifically with sheep, rams and ewes. However, not only did I isolate all 503 of the tablets and fragments dealing with sheep, rams and ewes from my cross-section of 2,500 tablets, I also further sub-divided all 503 of these by locales or sites at which the Minoans raised sheep, these being, from most to least often mentioned on the tablets, Kytaistos, Phaistos & Lykinthos (20 times each), for a total of 60; Exonos (15 times); Davos (14); Lato & Syrimos (12), for a total of 24; Lasynthos (9); Sygrita (8); Tylissos or Tylisos (5) and Raia (2), Knossos never being even mentioned at all! What! I here you say... and me too. Come on, this begs the question. Why? Why not Knossos? It is patently ridiculous to assume that no sheep were raised at Knossos, since Knossos was a city of a population reputedly exceeding 50,000, an enormous city for the ancient world (aside from Rome, of course). None of the other locales listed in our table come remotely close to Knossos in size or economic power and significance, not even Phaistos. The Minoans had to have raised sheep at Knossos, of that there can be no doubt. But how many of the overall 503 tablets mentioning sheep, rams and ewes can be said to deal with Knossos? Although we could ideally postulate a total of 365 times, the remainder of the 503 tablets, this is a highly problematic question, since there is simply no way of knowing whether or not the scribes were referring to Knossos and Knossos alone whenever they omitted to name the locale for sheep husbandry. It seems quite conceivable, even reasonable, to assume that the majority of the remaining 365 tablets and fragments, or at least most of them, do deal specifically with Knossos, but there is really no real way of our ever knowing. However, there is one tell-tale statistic which may serve as a real clue to the incidence of sheep raising at Knossos, and that is the figure for the number of times Tylissos is mentioned, i.e. only 5 times, even though Tylissos was an important Minoan site. The point I am making here is simply this: Tylissos was right next door to Knossos, practically an outskirt of the city. So if Tylissos is mentioned less often than every other sheep raising locale, with the sole exception of Raya (3 times), then were were the sheep being raised near or at Knossos? The answer seems transparent enough. At Knossos itself, or at least in the countryside surrounding Knossos, which would almost (but not quite) include Tylissos. So this is my hypothesis, namely, that in all probability most of the remaining 365 tablets and fragments do deal with Knossos, since as I have already said, it is patently impossible that Knossos was not the major sheep raising locale in the Minoan agri-economy. There is another angle from which we may approach my assumption. Let’s say I am talking about my own garden (today, in the twenty-first century). Now since my own garden is right here in the city I live in, what is the point of saying “my garden in Ottawa” to other folks from Ottawa, since they already know that? The only time it would be necessary to refer to “my garden in Ottawa” would be when I was showing my garden at the cottage to my friends, and I wished to distinguish it from my other garden in Ottawa. Likewise, if I am referring to my mother’s garden, which happens to be in Toronto, while speaking to friends in Ottawa, I have to say “my mother’s garden in Toronto”, unless they all already know that. You see my point. By analogy, if scribes, all of whom lived in Knossos, were referring to sheep husbandry at Knossos, why would they bother mentioning the city as such, since they would have been sharing this information with their fellow scribes and literate administrators in Knossos itself. On the other hand, if they had to refer to sheep raising absolutely anywhere else, even at Tylissos, which was not quite at Knossos, they would have had to mention the site by name; otherwise, their fellow scribes and co-literates would have had no idea where the sheep were being raised, which defeats the whole point of inventorying or compiling such statistics in the first place. 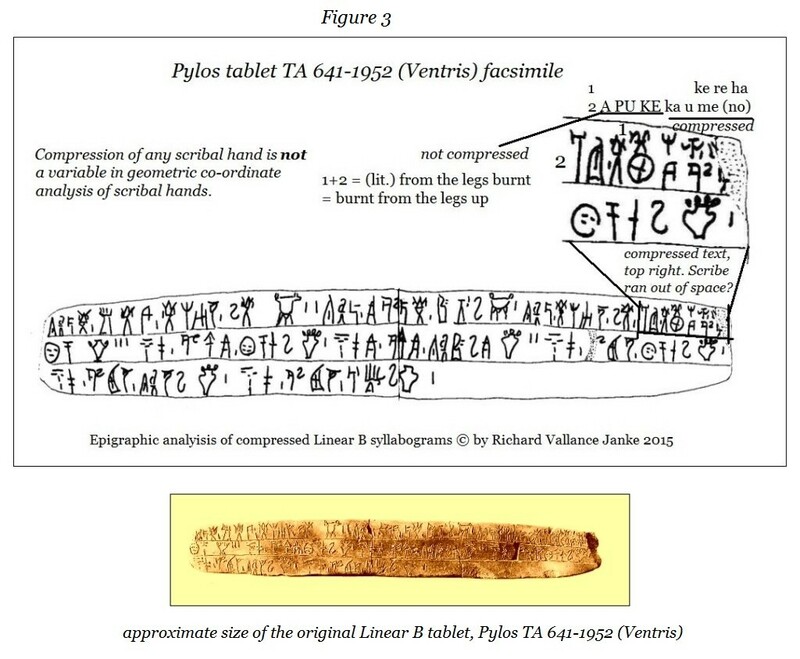 Remember that the Minoan scribes writing in Linear B (not Linear A) were space-saving freaks, to say the least, since the tablets were usually very small. So by not mentioning Knossos as a sheep raising locale, since they lived there after all, they saved precious space on their tablets... yet another reason why Knossos was in fact never mentioned. Anyway, people are lazy by nature, and would rather not do any work they can avoid. 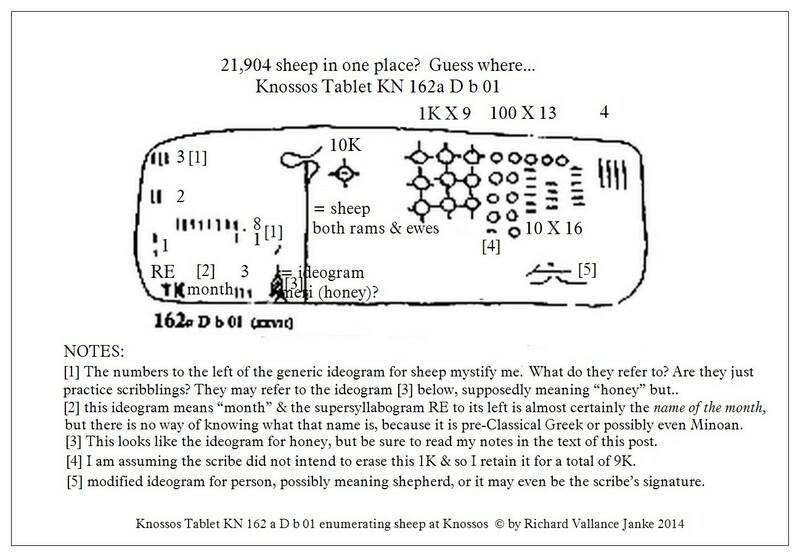 So either they would have mentioned Knossos all the time, however many times it would have been the default locale for sheep raising (because, in fact, Knossos was the default location for sheep husbandry) on those remaining 365 tablets, or they would not have mentioned it all. We know of course they did not. All of this is speculation, of course, but it is rational speculation, I dare say. And, believe it or not, there is yet another way to approach this hypothesis, and this approach is in fact purely statistical. Whenever we are confronted with a tablet or fragment from any of the other sheep raising locales specifically inventoried in the table above, when we examine the tablet for the total number of sheep raised at any one of these locales, we discover (and this is very significant) that nowhere are more than a few hundred sheep, rams or ewes mentioned on these site-specific tablets and fragments. The reason for this is probably that there was not enough available land at these sites to raise more than a few hundred sheep at a time. On the other hand — and I must lay particular emphasis on this point — on several of the remaining 365 tablets or fragments, 1,000s or even 10s of 1,000s of sheep are tallied. Now where on earth except at Knossos would there be enough room to accommodate so many blasted sheep? I think I have made my point. I can see some of you object (some perhaps even loudly), how could any place, even Knossos, have enough room in the surrounding countryside to accommodate almost as many or even more sheep than the general population of the city, without stripping the top soil bare, causing irreparable environmental damage and making one stinky countryside? It is hard to counter such an objection, which is entirely rational on any count. Still, we do not know whether the Minoans practised land rotation. However, given that their civilization was so advanced and sophisticated, with their basic grasp and sound implementation of the principles of hydrology to city plumbing never again to be matched until the end of the 19th. century of our era (! ), it begs the question whether or not they were familiar with, and indeed practised land rotation for sheep grazing. I for one would be willing to bet at least 50/50 that they did... a practice which would have effectively preserved available grazing land, and made Knossos a perfectly suitable place to raise sheep, and scads of them. But there is still more. 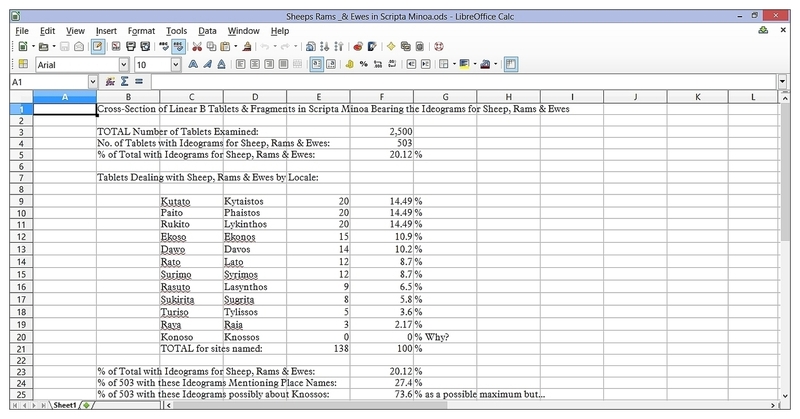 Of the 2,503 tablets and fragments from Knossos I examined, those dealing specifically with sheep, rams and ewes account for fully 20.12 % of every last tablet, regardless of the area of interest in the Minoan society, economy, social structure, religious affairs etc. any and all of the remaining tablets deal with. This is a huge sub-set of all the tablets, and in fact, when you examine a cross-section of as many as 2,503 tablets of approximately 4,000, as I have done, you will discover, perhaps to your astonishment, perhaps not, that no other single area of interest or topic, if you like, in Minoan society comes anywhere even close to the number of times sheep, rams and ewes are specifically and almost always solely addressed on such tablets or fragments, i.e. 503 times. This speaks to the one area that literally grabs centre stage in the Minoan socio-economic and trade structure. It all boils down to one thing: the Minoan economy by-and-large revolved around sheep raising and husbandry, and the products which derived from it, such as wool, which also accounts for a fairly significant proportion of the remaining 3,500 tablets (though far from the numbers for sheep per se). Although there can be no denying that other areas of interest, such as raising pigs and other livestock, various crafts such as gem cutting, jewelry etc., religious issues, military matters, household affairs and so on, played a significant role in the Minoan economy and in their society, there can be no denying that sheep raising and husbandry was the keystone of their economy. There is simply no way of getting around this conclusion, given the fact that the cold, bare statistics practically shout this at us. Of course, many of you will object, statistics aren’t everything, or even all that reliable as an indicator of anything, for that matter. And of course, you would be right... except for one big thorn in our side, namely, the fact that statistics for the number of fragments and tablets dealing specifically with sheep, rams and ewes is so huge (20.12 %) that it could very well make the objections of our doubting Thomases almost irrelevant. I have not yet formally compiled statistics for the incidence of tablets and fragments dealing with any other aspect of Minoan life whatsoever, but I can assure that, even on examining all of these tablets quite closely, no other area of interest whatsoever comes even remotely close to the overwhelming figure of 503 tablets or fragments specifically focusing on sheep, rams and ewes (20.12 %), accounting for fully 1/5 of all 2,503 tablets and fragments I examined. The next post will provide us with two examples of the 138/503 site-specific Linear B tablets dealing with sheep, rams and ewes.